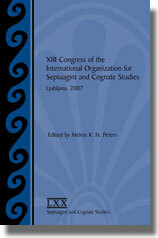 Under the auspices of the Society of Biblical Literature (SBL), the IOSCS publishes a monograph series, Septuagint and Cognate Studies, refereed by its Editor (a member of the Executive Committee) in consultation with other scholars at the Editor's invitation. The current editor is Wolfgang Kraus, and the editorial board is composed of Karen Jobes, Rob Hiebert, Siegfried Kreuzer, Philppe Le Moigne, and Arie van der Kooij. To safeguard the integrity of the peer-review process, the names of reviewers are not published. A list of the volumes in the series, along with links for purchasing, is available at the SBL web page for the Septuagint and Cognate Studies series.